I love the summertime. Going outside without a coat, night time bike rides, playing music in the park, swimming, growing food in the backyard, fiddling in the garage, and one of my favorites...going to the U.P. (that's the Upper Peninsula of Michigan, where my hometown of Marquette is located, right on Lake Superior). Jody and I decided to take Charley for his first trip to the U.P. I grew up playing music that was just created by an old friend. It is a grounding feeling to have the past and present come together with such ease. I know there are a lot of people out there who have a problem looking, let alone going to the places in their past. I know I am a fortunate soul to be in the place where I grew up and doing something new. It is right in line with my undying desire to live in, and serve my community. These days it is so easy to be in a far away land, but still stay connected to your home. Communities of people are brought together through communication lines that I did not dream of even when in High School. It is very easy for Jared, who is in L.A., to contact me in Ann Arbor, and Mike in the U.P. and set up a time to meet, change our minds at the last minute, change the time, let each other know if we are going to be late, all before we even talk to each other. e. I still believe this. I had a computer teacher at CalArts, his name was Dave, and he told us that all this computer connectivity will not lead to the de-personalization of society, but rather to a re-personalization. I see now what he means. I have had some great relationships and interactions with people that I have never met face to face. I do feel lucky, grounded, and thankful for the fact that most of what I do for a living involves actual interaction with not only the people, but also the space we are in. So the show with Jared Mike and Nora went well. I was so proud of Jared for all that he had accomplished. Not only did we play and entire set of music where every part, every arrangement, every melody, harmony, and rhythm were all created from Jared's mind, but we were also treated to a full hour of compositions Jared had written. It was just a guitar and him on a mic. The songs were all his. Some of them were songs that were performed by his former band Hello Stranger, some were old ones I used to hear him play sitting around the fire when we lived together in Val Verde, CA. and some were new to my ears. All of them were songs he created and obviously loved. The audience was full of good friends and family, with a few hotel guests mixed in. It was a nice evening and I was very happy to be a part of it. Not to mention it was a great way to begin our time in the U.P. of home projects, visiting friends and family, and unwinding from the school year. Now it was time to play music. I couldn't think of a better way to start it off than with two straight hours of playing tabla for Ann Arbor Kirtan. I haven't gone to a kirtan so relaxed in a long time. It was a very nice experience, almost like I was on the sideline watching, not actually playing. I really appreciate those times in life where there is not tension or stress. If I can be playing music without those two things, I will be a very happy man. The following week my new Indian group Sumkali played at Crazy Wisdom tearoom in Ann Arbor. We were still reeling a bit from the Top of the Park experience the month before, and without the pressure of that performance on us, I feel like everyone in the group loosened up and just played. We played for our usual 2 hours straight and, as usual, it seemed to go by fast. For me, loosing yourself in time is a good sign that you are creating something good, especially if you can do it with 5 other people and countless others watching. One interesting thing that happened at this show didn't have anything to do with the music. Meeta leaned over to me before we started and said, "That guy over there looks like the guy from Alias". She mentioned it a couple of times, but never went over to ask him. After the gig, she did some research on Twitter and as it turns out, it was Kevin Weisman who plays Marshall Flinkman on the show. He was in town filming a new Rob Reiner film. Cool! Hope you enjoyed it Kevin! r has involved one tabla gig and one drum set gig, but this was two drum set gigs, so the logistics were a bit more complex. I do have 2 complete drum sets, but not enough cases, so transportation was a bit of an issue. Needless to say I also needed to enlist the help of my student Vinnie Russo to help set up my set at Gracies. I used my smaller student set at the mall so I could get packed up and out of there quick. As long as I did not run into traffic, or have any car troubles, I would just be able to pull this off. .I did not pack a snare drum! Yikes! So after a few failed attempts at calling some drummer friends I know in Flint I went to plan B, which was trying to fashion a snare drum out of my floor tom. The only thing that makes a snare drum a snare drum is the wires, (or snares), that are strung across the bottom of the drum that snap against the bottom head when you hit the top. 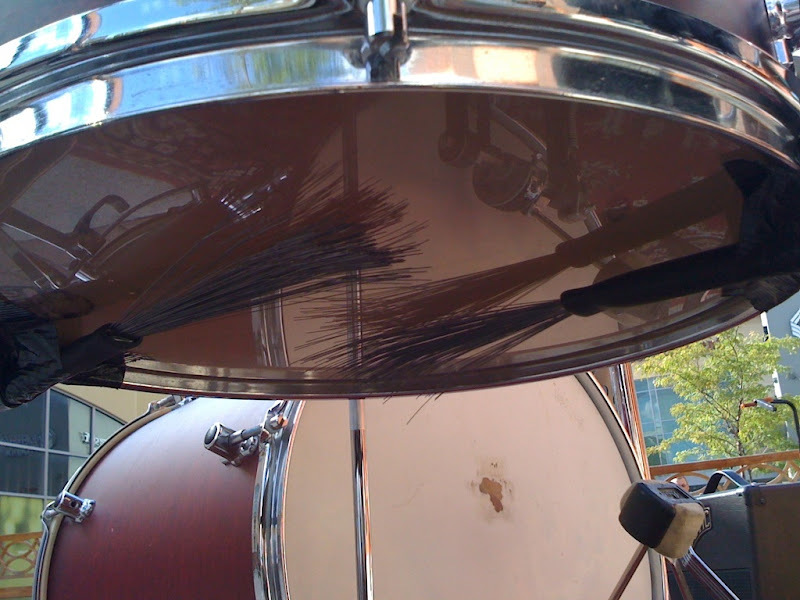 So after digging through my gear for wire, I pulled out my wire brushes and taped them to the bottom head of my snare drum. Scott and Paul huddled around the drum as I taped it up. When I tapped the top of the drum and a snare-type sound came out, everyone sort of sighed and felt a bit more relaxed. I, on the other hand, was bummed that, after all the careful planning, I had left my snare drum in my studio and now I was playing with a really deep snare-ish drum and no floor tom. 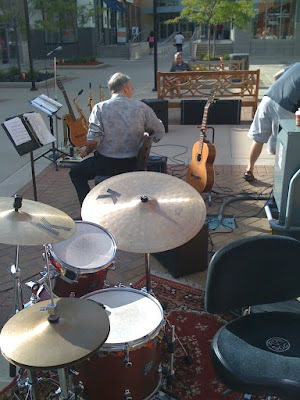 The group played a lot of bossa and latin songs so I did not have to rely on the weak snare sound. (Bossa and latin music uses the stick on the rim of the drum to get a click sound instead of hitting the drum itself). The show went fine and I even took some drum solos. I wondered if there were any drummers watching us play and wondering what the heck kind of set-up I was using. One good thing about it...I did not have to pack up a snare and stand, so I saved about a minute of transition time. So I bid adieu to Deep Blue and headed for Ann Arbor. It was smooth sailing the whole way. I parked my van, took a deep breath and gave thanks for everything working out, even with the hiccup. I love the feeling of walking to a venue with nothing more than a stick bag. It feels great to know that the drums are all set up and all I have to do is sit down and play. It is a small thing, but it totally changes the feel of the night. I am able to focus better, relax, and even put energy into coming together with the other members of the group. So I showed up with about 10 minutes to spare before showtime, but as I walked to the door I noticed Vinnie and Dan sitting outside, which was pretty unusual. 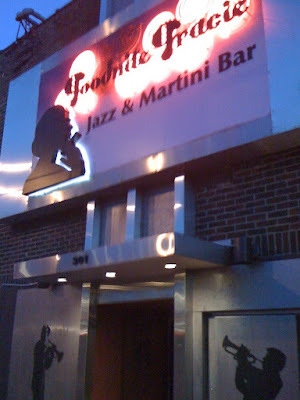 I asked what was up and they told me Rob, the bass player, had not shown up yet. This was a bit more serious than a forgotten snare drum. We could not get a hold of Rob, so Dan started calling other bass players, all of them turned out to be busy. Just as it was time to come up with a plan b, Rob pulled up. We had just a minute or two before we were supposed to start, so there was no time for explanation. Vinnie and I helped Rob get his stuff in and we were set up and ready to go right on time. Dan was a bit frazzled, but it all melted away once the music started. I was just happy to be playing on a full drum set! The night went great and by the end I was ready to keep playing. I had a lot of drums to take out of my car after the show, but I was thankful that it went well. That is all for July, thanks for reading and I will write again soon!